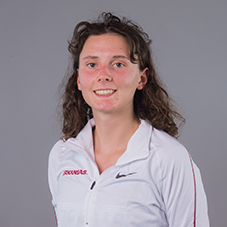 Began her career as a Razorback at the Cowboy Preview (Sept. 1) finishing with a time of 11:53.00 over the 3K course, placing 31st overall. 2016 track and field All-Sunflower team selection … Top-five finisher at the Kansas Relays (800) in 2016 … Placed fourth at the 2016 Kansas 6A State Championship with a time of 2:17 in the 800 … Contributed to the Shawnee Mission East claiming the 2016 Regional team title … Has a PR in the 1,600 of 5:15. Born on Nov. 25, 1997 … Daughter of Bill and Linda Iler … Majoring in marketing.